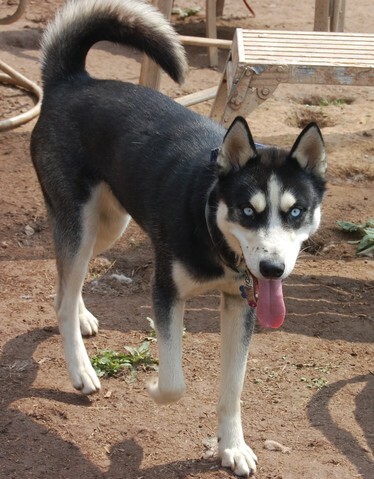 Bandit is handsome young husky who is approximately 1.5 years old. He has a striking mask, mischievous blue eyes and wears a constant big grin. Sadly, life changes with his previous family caused Bandit to be alone too much of the time. Bandit is still very much a puppy and has lots of energy. He is a curious, high energy pup quick to find mischief and many things to entertain him. If there is any fun to be had, Bandit is sure to be right in the middle. Like most young Siberians, Bandit needs a home that will love him and work with him to continue his canine manners as he matures into adulthood. He would greatly enjoy a home with a tall sturdy fence to run and play in. Bandit is not always good with other males and a young female canine friend his size or larger would be best. If you are looking for a lasting relationship, please consider this tall, dark and handsome man.